If something's unforgettable... how can you forget it? Great ideas can come to you at any time, day or night. That's why I make it a point to write them down as soon as possible, ESPECIALLY when I think they're so obvious that I'll never forget them, because time after time, those are the ones I definitely forget. Writing down your ideas not only insures you won't forget them, but it also frees your mind to relax and focus on other things, which makes you more productive as a whole. How do I create a new idea each day? People often ask me how I manage to come up with a new idea each day for my blog and YouTube Channel. The simple truth is, I don't start off by thinking of ideas... I start by looking for problems. That's because it's pretty easy finding problems. In fact, I think it's safe to assume we all face at least a few new problems each day, so I start by writing down the problems, then thinking of solutions to those problems and before you know it... ideas are born! Most of the greatest ideas didn't start out that way. They start out as a simple idea, and they evolve over time. Great songs start with a simple melody or riff. 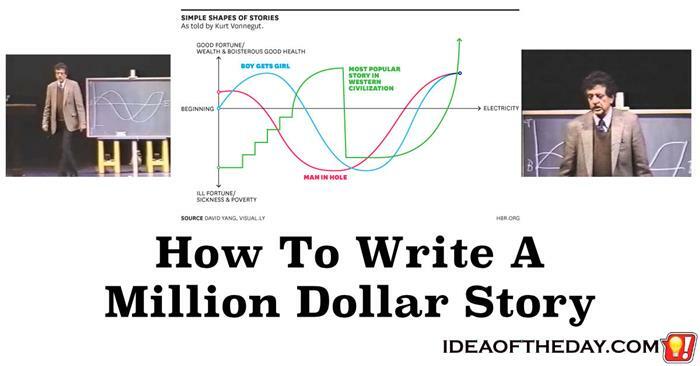 Great paintings start with a crude sketch, and many great novels start with a simple outline. The key is they all had to start somewhere. When Bad Ideas Are... Good. Don't get me wrong. 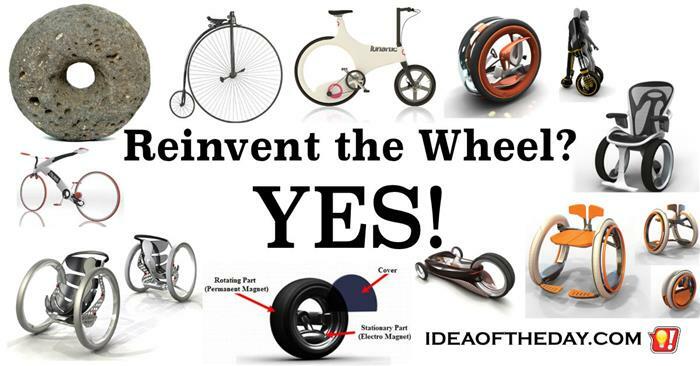 I love good ideas too, but very few of them would exist if it wasn't for the countless bad ideas that inspired them. To me, a bad idea is like finding a diamond in the rough. There's something valuable inside. 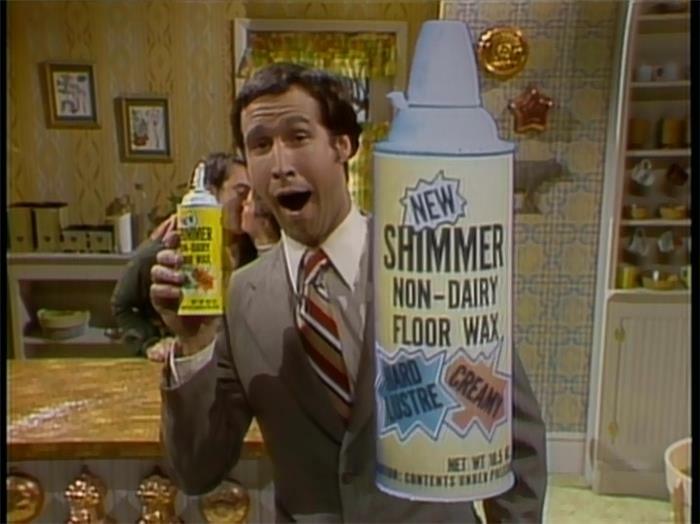 You've just got to chip away the crud on the outside before you can let it shine. Most of us remember Apple's greatest ideas, but most of those ideas are a direct result of Apple's commitment to research and development. 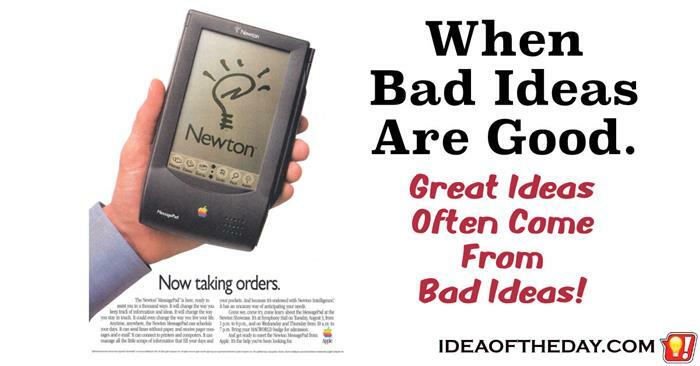 Almost every successful product was the direct result of a bad idea that they improved. Thankfully for Apple, some of those bad products were first introduced by other companies, but quite a few were from home-grown failures. 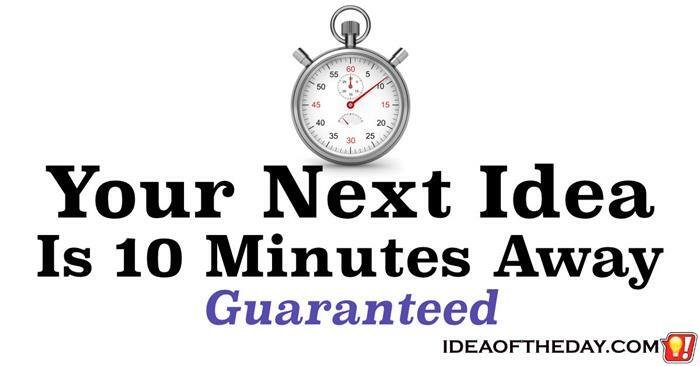 Your Next Idea is 10 Minutes Away... Guaranteed. Some people wonder how I can come up with an idea every day. Here's how: I try. It may sound funny, but the real key to coming up with a new idea is... taking 10 minutes to focus on finding one. When I do that, I always come up with at least one or two. I get so frustrated when people tell me they aren't creative and they aren't good at brainstorming new ideas. I've got news for you. I'm an idea guy, but I'm not special. I don't have any special powers that "Non-Creative" people lack. It's truly just that I try. Most of the people who say they aren't creative have never sat down with the sole purpose of coming up with an idea. As Yoda would say "That is why you fail". It's not a lack of creativity, it's a lack of trying. 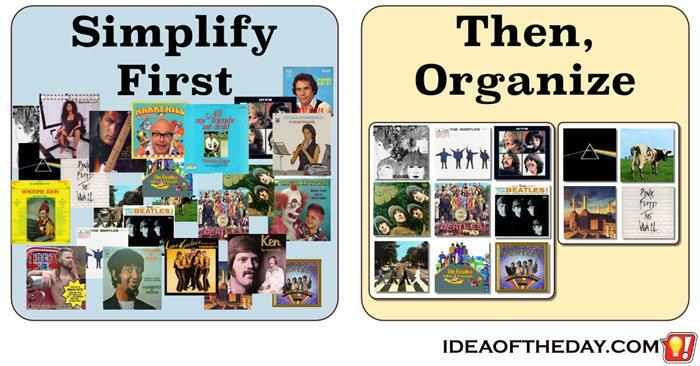 One of the reasons some people have a hard time organizing is they have too much stuff to organize in the first place. If I gave you 2 cards with a number on the back, and asked you to put the highest number on top, odds are, you could do it in less than a second. It would take you a bit longer if I gave you 10 cards, but what if I gave you 500 cards? Clearly, the more cards I gave you, the longer it would take to sort them. Trying to sort out 500 of anything isn't easy, no matter what they are. Whether it's your record collection, files on your computer, a garage full of stuff, or even abstract things like the ideas in your head. The fact is, the more stuff you have to organize, the longer it will take to do it.